The EU Advisory Mission (EUAM) Ukraine and the Kyiv Patrol Police completed the first phase of a joint project yesterday to renovate the Administrative Services Hall of the Patrol Police Headquarters in Kyiv and provide training in communication and stress management. The whole project is planned over six months and in the first phase the 40 staff of the Centre were trained in small groups. The training focused on dealing with customer complaints sensitively and efficiently. In every client-facing job, there will always be difficult moments and the course provided tips on how to handle complaints professionally and diffuse potential tension. The renovation of the Administrative Services Hall focused on creating a physical environment which will lead to a client-friendly environment and high-quality administrative services. The hall was rearranged and equipped with additional chairs for clients, information boards and a hanging rack for filling out applications/complaints. 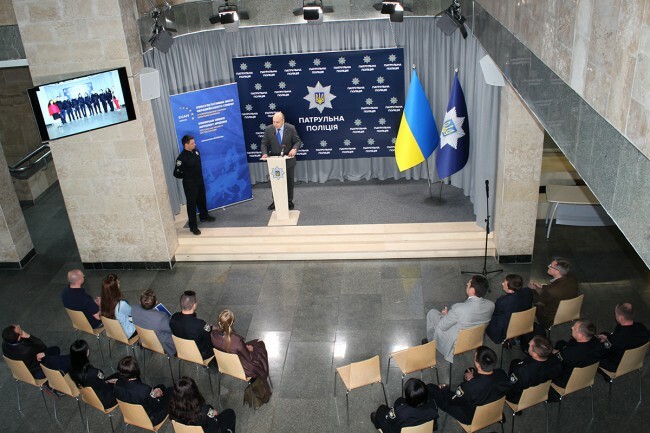 “The cooperation between EUAM and the Patrol Police has been excellent throughout this project. The Patrol Police has made a commitment to making the whole organisation more citizen-oriented and this is a great example of how small-scale activities fit into the wider reform agenda,” said the Head of the EU Advisory Mission Kęstutis Lančinskas. The relationship between the staff at the Centre and EUAM will continue, as the impact of the training will be assessed to see whether citizens notice differences in service provision. Further support for the participants in the training will also be delivered by EUAM to ensure that they can utilise their new skills and knowledge in their day-to-day activities.